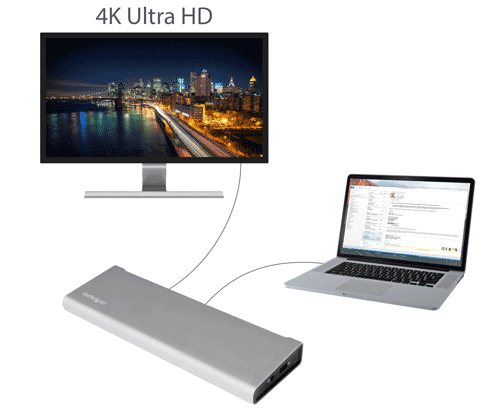 If you’re looking to add a 4K Ultra HD display to your laptop, then this dock can help. 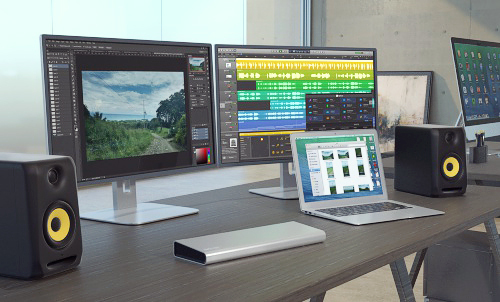 The dock delivers vivid 4K (3840 x 2160p - 30Hz) image quality to a single DisplayPort or Thunderbolt monitor. 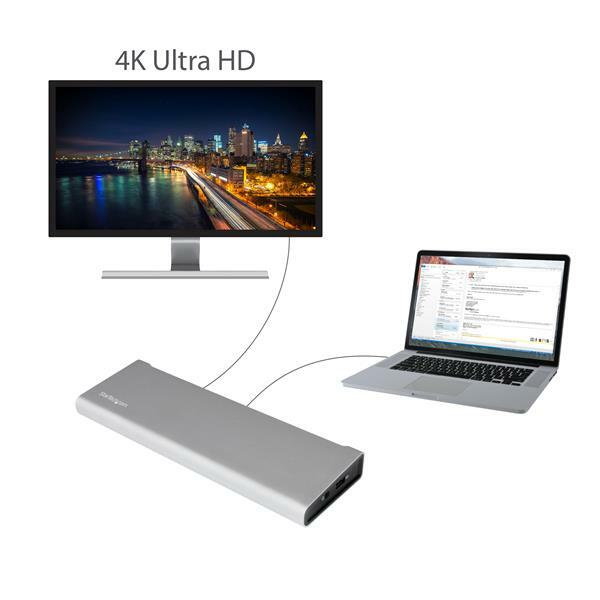 And, because it supports DP++ you can connect a 4K HDMI® display using a DisplayPort to HDMI Adapter (SKU: DP2HD4KADAP - sold separately). 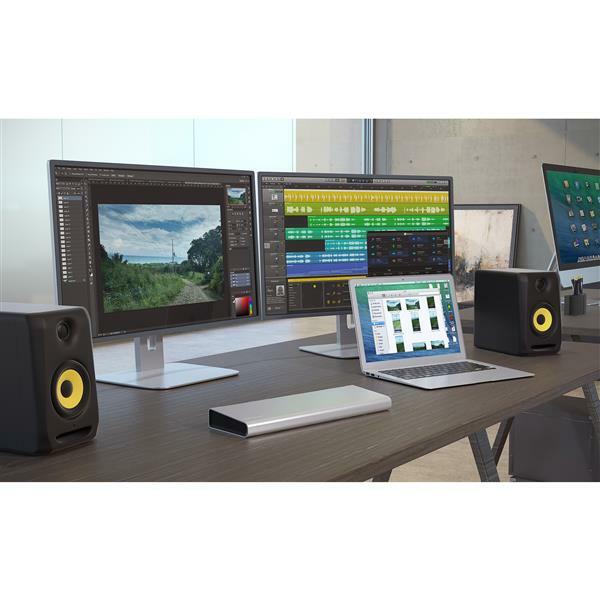 It’s perfect for web and graphic designers, animators, or anyone who works with high-resolution videos and images. 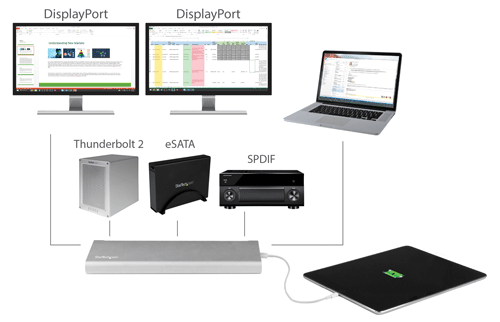 The TB2DOCK4K2DP is backed by a StarTech.com 3-year warranty and free lifetime technical support. 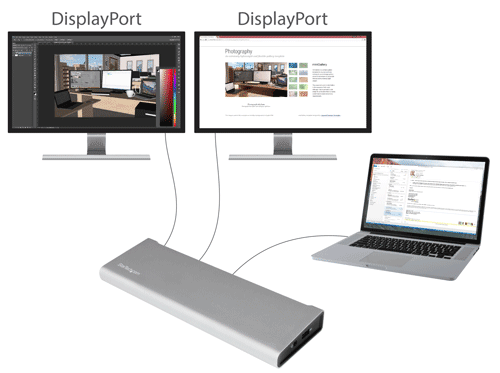 *The docking station does not support three displays unless connected using a Thunderbolt daisy chain. 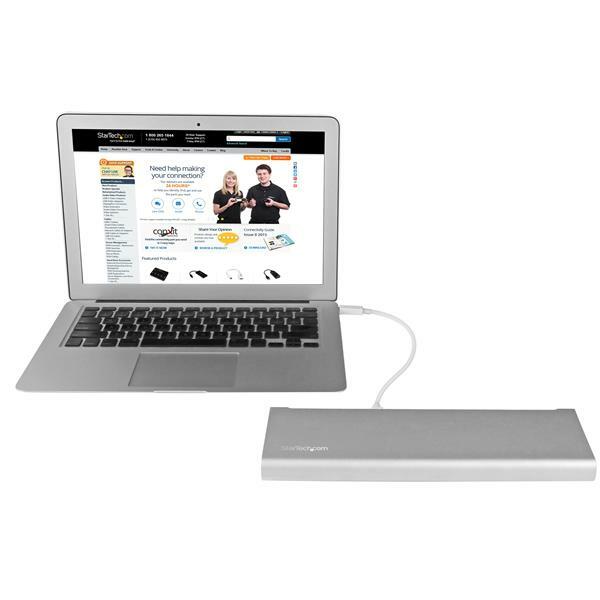 I have used this dock with 2014 MacBook Air and now with 2018 MacBook Air with an Apple TB2 - USB-C adapter. With 2014 Air I had this problem with monitor arrangement, whenever my two displays woke up from sleep the right-left screen placement got switched so the mouse didn't run across the two screens properly. With 2018 Air, one monitor stopped detecting video signal ( I see somebody else had the same problem) and my USB keyboard hooked to the dock also stopped working. These problems occur when the system wakes up from sleep. By restarting mac and powering the dock off and on again I was able to go back to the problem free state, but you don’t want to do this every time you wake your system up. I was able to work this around by checking “Prevent computer from sleeping automatically when the display is off” in Mac System Preferences > Energy Saver. (this is unchecked by default). Setting the “Turn display off after” slider to “Never” also worked. 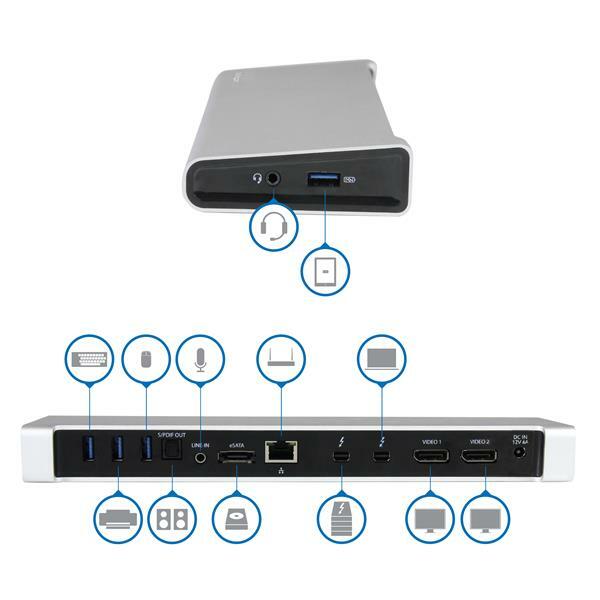 Hope this helps people with similar problems, because the dock IS a nice accessary if you want to connect a lot of devices to your laptop. The dock works fine as long as I don’t let my system sleep. This was purchased for a Mac Air user at our company and initially I plugged it in and it worked perfectly. 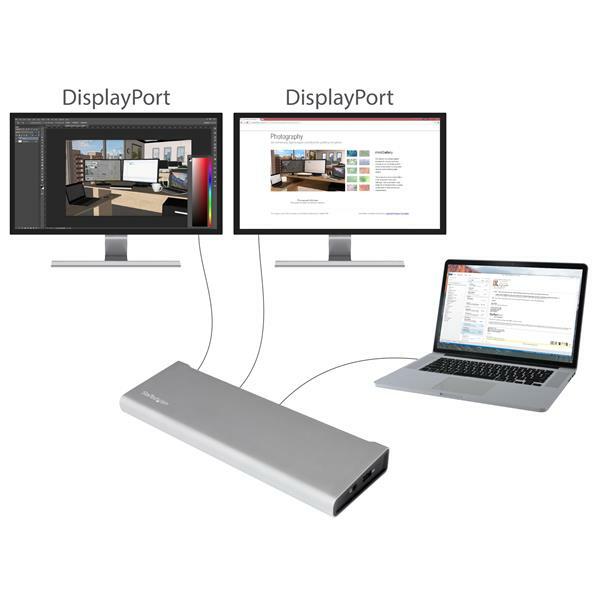 I have dual monitors using DisplayPort connections. However, after a few days, only one monitor will work at a time. I can no longer get both to connect and display at the same time. I wrote the first review for this product and I gave it a 3 stars. The unit I had received had an issue where it overheated and then started rendering weirdly, making using the product somewhat difficult. After writing my review, I was contact by Startech's support team with in 24 hours expressing concern of my issue and looking for a way to fix it. After working with them for a while, they replaced the unit for me at no charge. Their customer service was excellent and really made what was a so so experience into a great one. 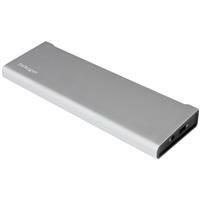 I have been using this product for a few weeks, and as a way to add dual monitors for my macbook air it is great. However I have noticed that if I leave the device plugged in it gets quite warm and this causes one of the monitors to render really slowly and poorly. This makes using that monitor very clumsy and somewhat difficult. I have found a way around this, by unplugging it at night when I am done working, but it is rather inconvenient for a device at this price point to need to be plugged and unplugged to keep it from overheating. 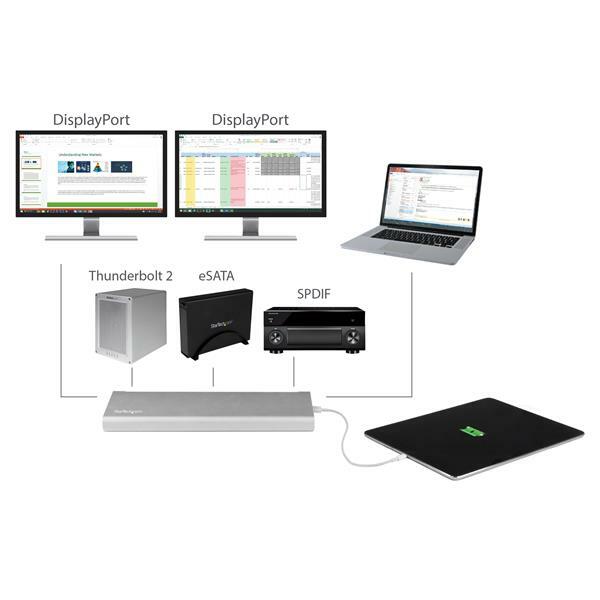 Hi Charlie, Thank you for taking the time to leave your feedback on this Thunderbolt 2 dock. We appreciate your time and hope we can help! This dock will run warm. However, it should not be considered "hot" and obviously not cause any performance issues when in use. We would like to investigate this further and possibly provide a replacement for you. 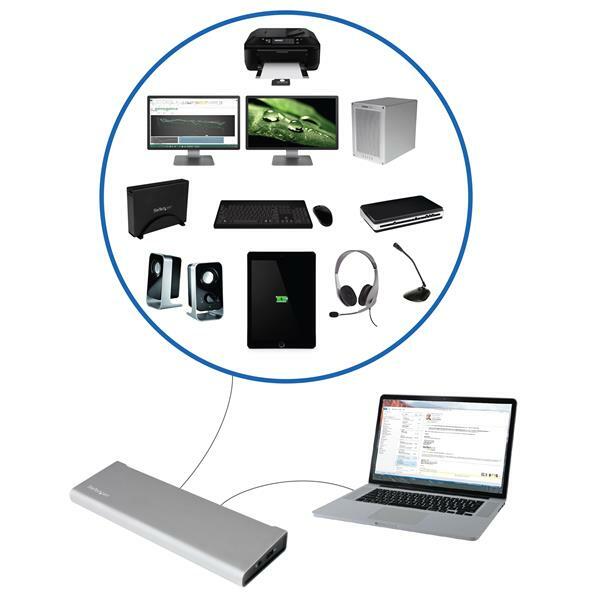 One of our Technical Leads will be in touch with you via email to obtain some additional info. 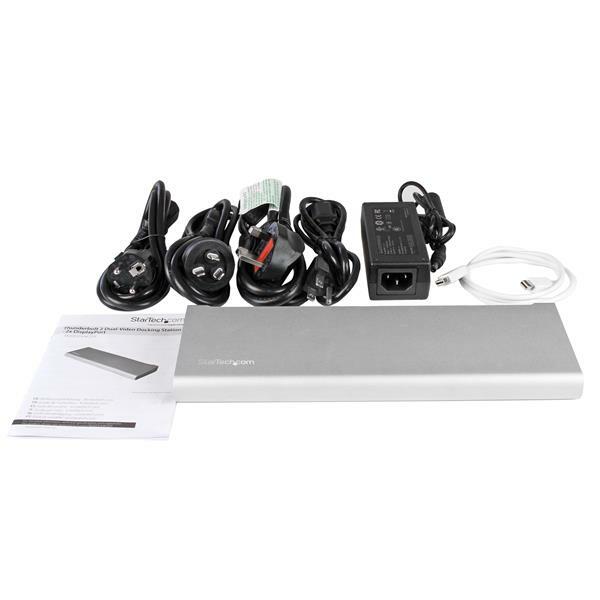 One final point, be sure that you are not using this dock as a riser for your laptop, as it may stop the dock from dissipating heat effectively. Thank you.